In a world filled with ever changing and increasing threats those who work in public safety must continue to develop and prepare to meet those threats. Criminal investigations no longer stop at the water's edge. 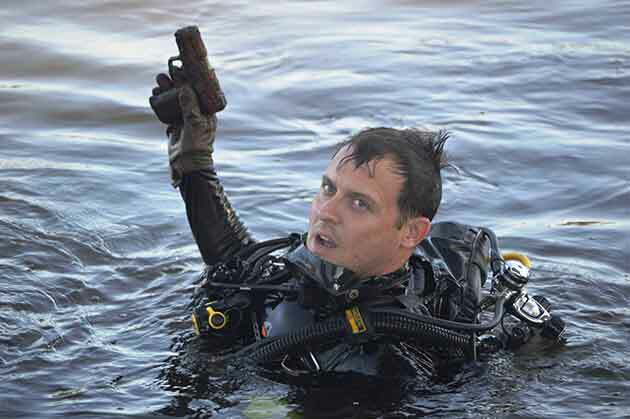 It is expected that the dive team who recovers the evidence do so in a manner that is as professional and proficient as any investigator on land. They are designed to prepare public safety dive teams to professionally and proficiently exceed the standards expected of today's public safety professional. Many public safety dive teams conduct urgent rescue dives in an attempt to save lives. The knowledge to safely and efficiently rescue someone is irreplaceable in the public safety diving community. These skills are also in demand on public safety recovery teams. Their divers often must enter waters that can pose hazards to the team members. Having trained public safety divers, on site, ready to conduct a rescue, can mitigate some of these threats. Knowledge development (home study and in a classroom) to understand the basic principles of public safety diving. Open water exercise dives to learn basic rescue skills and refresh the student on basic dive skills. Open water dive scenarios to provide the student and dive team opportunities to put into practice the skills and knowledge they have just learned. Required Gear: Mask, fins, snorkel, dive boots, at least 2 separate cutting devices, visual and audible surface signaling devices, pocket mask, and at least a light weight wetsuit. Through a series of rigorous dives you will gain invaluable knowledge about public safety recovery diving from skilled professional public safety divers. This is truly a hands-on training program that involves intensive diving to prepare the public safety diver for the challenging diving conditions normally faced in this field. The first part of the course involves knowledge development in a classroom setting. It is in this section in which you will learn about the fundamentals of recovering objects and victems from underwater. This knowledge is important because you will later use it to help you conduct searches, recoveries, and document each step of a mission. The second part will consist of at multiple dives. On these dives you will further develop the knowledge you learned in the first part. 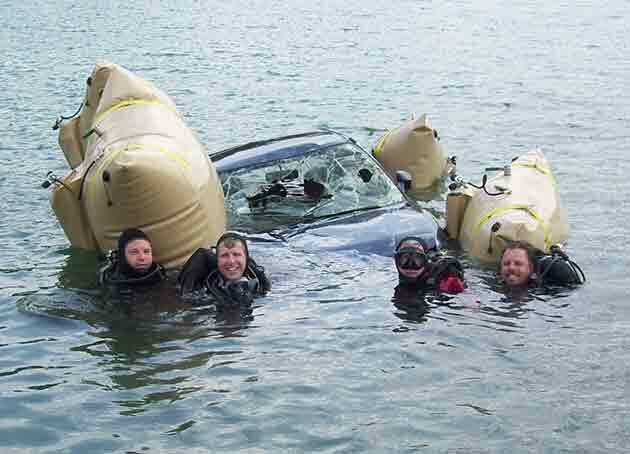 You will practice different searching and recovery skills in controlled, but realistic situations. Much of this diving will be conducted in low to zero visibility environments. The third part of the Course will consist of actual searches in areas objects may have been disposed of. These may be conducted in a lake or river; your instructor will advise you as where your class will be diving. During the mission dives you will put all of your dive skills to the test. This set of a series of courses builds on your previous public safety training. It focuses on training you o use advanced techniques to conduct some very challenging recovery situations. It focuses on four areas; advanced body recovery, vehicle recovery, advanced evidence recovery, and underwater metal detector skills. Finally, the dive team must employ all of these skills to resolve two complex scenarios. Each subcourse starts with a knowledge development building classroom session, where the fundimentals of the skill are discussed. The classroom knowledge is then applied to open water exercise dives. During these dives, the team has the opportunity to develope and then practice these advanced skills. Finally, on the last day, the team is presented with open water dive scenarios. During these scenarios, the team will be presented with challenges they must resolve using the skills they have mastered during the previous classes.